In these days when trust is at an all-time low and relationships are strained, the Body of Christ needs to learn how to work through conflict in healthy ways. When we truly understand covenant relationships, we should be empowered to work through differences in ways that build trust instead of eroding it. 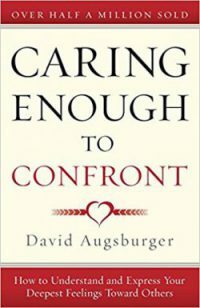 In this short teaching I gave to our leaders recently, I share practical tips and insights from David Augsburger’s classic book, “Caring Enough to Confront.” We have used these principles for years and have found them extremely helpful in equipping people to walk and talk through conflicts. Though we certainly need to address the issues and find solutions, our first goal should be to better understand each other as fellow believers. I encourage you to watch it and share it with others so that we in the Church can model what it means to be a healthy family.